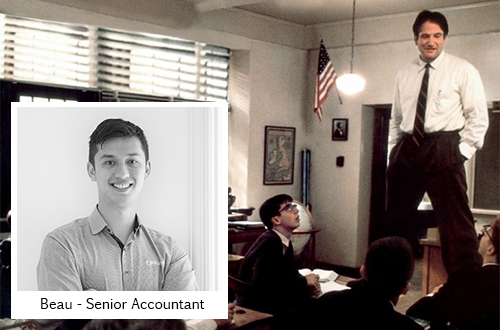 The other day while watching one of my all-time favourite movies Dead Poets Society, I couldn’t help but notice some similarities between this movie and the work we do as accountants. For those of you that haven’t seen the movie (if not, go watch it!) it stars the late Robin Williams who plays an English Teacher named John Keating who begins teaching at a very exclusive all-boys school in the 1950’s. Robin William’s character (Keating) and the students develop strong relationships with one another. Keating challenges his students to push boundaries and take the opportunities in life that present before them. Keating aims to teach and guide his students carefully through their current obstacles and prepare them for what may lie ahead. I liken Keating to that of the accountant, and the students in the movie to that of our clients. Keating is there to support and guide his students much the same as Highview accountants are there to support, mentor and guide our clients. As an accountant we aim to give the best possible advice and direction to our clients to enable them to reach their goals. A strong theme throughout the movie is about taking your opportunities and the quote “Carpe Diem” which is Latin for “Seize the Day” is frequently used. Your accountant is there for you to help you ‘Seize the Day’ by giving you their expert advice and insights to help you succeed in your financial goals. Whether you are an employee or run your own business, there are opportunities that may be available to you through effective tax planning such as utilising superannuation concessions, negative gearing, small business instant asset write off concessions, changing business structure or pre-paying expenses before the end of financial year. I believe the most important lesson to come from this movie is to do what you love and are passionate about. If you are someone who has a business idea or opportunity that you wish to explore further, you should reach out to your accountant who is there to be your trusted advisor much like Keating was to his students. Article written by Beau Appleby, CPA Accountant from Highview Accounting & Financial Prahran.